On June 1st, pre-registration membership pricing will go up to $30. Be sure to purchase your membership now if you haven’t already. You have until end of the day of May 31st to lock in the current rate of $25. Be sure to take advantage of the discounted pricing while you can. 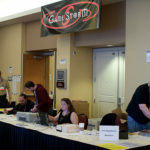 We look forward to seeing you at GameStorm 17.